San Francisco is a mecca of all things alternative, punctuated by a top-rate foodie scene, some stunning vistas, and those giant homes from Full House. If you’re getting ready to visit the Bay Area, you’re in for a treat. But if it’s your first trip there, you’re probably asking, “What do I need to pack for San Francisco?” Read on for the complete San Francisco packing list, with a section on what to wear in San Francisco and what NOT to bring. Toward the bottom of this post, you’ll also find a list of what NOT to take to San Francisco, as well as some frequently asked questions about the costs, logistics, and highlights of travel there. Remember, anything goes in San Francisco, so you never know what you might see. Approach the city with an open mind and a sense of humor, and you’ll probably fall in love with it. What should I bring on my San Francisco trip? 1) Rain jacket: Women’s and Men’s> – San Francisco gets about 70 rainy days per year on average, mostly between November and March. If you’re visiting in the winter, any checklist for traveling to San Francisco needs to start with a rain jacket (and a solid list of things to do on a rainy day!). 2) Sweater: Women’s and Men’s – San Francisco is notorious for disappointing people who come expecting warm weather. In fact, locals can easily spot out-of-towners by their summer clothes, or sweatshirts bought out of desperation from the city’s attractions. Even during the summer, it usually only gets up to the low-70s, so a sweater is definitely one of the essentials to take to San Francisco. 3) Scarf: Women’s and Men’s – A scarf is a simple way to dress up an outfit, and it’s something you can easily put on or take off in response to San Francisco’s unpredictable weather. A medium-weight scarfwill be useful nearly any time of year, and will take up almost no space in your bag. 4) Tights/leggings – For women, adding tights or leggings is an easy way to make skirts and dresses more suitable for cool weather. Unless you visit in San Francisco’s warmest month of September, you’ll probably want them more often than not. 5) Swimsuit: Women’s and Men’s – Whether you’re willing to brave the cold water to swim in the ocean, planning to visit a nearby hot spring, or just want to enjoy your hotel’s pool, a swimsuit needs to be on any San Francisco packing list. 6) Sandals: Women’s and Men’s – If you’re visiting San Francisco during the warmer months, you’ll probably want a pair of sandals, especially for going to the beach or walking around your hotel. 7) Walking shoes: Women’s and Men’s – Most visitors to San Francisco end up doing quite a bit of walking, and the city’s streets are notoriously steep and uneven. A pair of good walking shoes is one of the top things to bring to San Francisco, and the more comfortable they are, the more your feet will thank you at the end of the day. 8) Hat: Women’s and Men’s – San Francisco’s surprisinglycool weather and frequent winds mean you’ll probably want to bring a hat. While it’s a trade-off between hat hair and the windblown look style-wise, a hat will make those chilly days more comfortable. 9) Camera – While you could rely on your phone for taking pictures, it’s worth investing in a camera to get better photos of your trips. The Canon Powershot is relatively lightweight and doesn’t require any special skills to use, so it’s a great option for travelers who want to capture their trips but aren’t diehard photographers. 10) Sunscreen – Visiting San Francisco usually means spending a lot of time outside, whether it’s hanging out at Golden Gate Park, attending a festival, or just strolling through the city’s streets. Be sure to pack a bottle of sunscreen to protect yourselffrom the sun’s rays. 11) Solid shampoo – When you have to fit all your liquids in a tiny bag for TSA inspection, fewer liquids is better. Plus, using solid shampoo creates less plastic waste than the conventional kind, making it better for the environment. Not all solid shampoo is created equally, but Lush’s version works just as well as the liquid stuff. 12) TSA-approved travel-sized bottles – If you’re traveling carry-on only, you’ll need a few little bottles to pack your liquids. This set has every type of bottle you could need, all small enough to fly. 13) Rolling suitcase – Unless you’re planning on hauling your luggage all around San Francisco, or are just a committed backpacker, a rolling suitcase will probably be the most convenient. This one is small enough to be used as a carry-on but large enough to hold everything you’ll need for a short trip. 14) Packing cubes – Packing cubes are one of the best ways to stay organized while you travel. Instead of unpacking your whole bag to find thattop you swear you brought, just pull out the appropriate packing cube. No matter where you’re planning to travel, make sure you pick up a set of these. 15) Reusable cloth bag – Reusable cloth bags are always a good option for environmentally friendly shopping, but in an eco-loving city like San Francisco, they’re practically required. Do your part for the environment, and avoid the dirty looks you’d get for using plastic there, and put a cloth bag on your packing list for San Francisco. 16) Water bottle – When you’re spending most of your time wandering around outdoors, carrying a water bottle is essential. Again, using an eco-friendly bottle instead of a disposable plastic one is par for the course in San Francisco, so pick up a stainless steel version before your trip. 17) Sarong – When you travel, you might find yourself needing a picnic blanket, swimsuit cover-up, sheet, towel, or shawl – fortunately, a sarong can be all those things and more. They’re also cheap and super lightweight, so I almost always carry one when I travel. 18) Umbrella – Unless you want to risk getting soaked in one of the city’s winter rainstorms, make sure an umbrella is on your list of things to take to San Francisco. This is especially essential between November and March, but the city’s weather can be unpredictable, so it’s not a bad idea to bring one any time of year. 19) Wine bottle protectors – You can’t go to San Francisco without visiting Napa Valley or Sonoma Valley, and you can’t visit world-class wineries without bringing a few bottles back home. But a broken wine bottle is not only a huge waste, it will also create a huge mess in your bag. To make sure your delicious wine stays safe on the trip home, pack it in wine bottle protectors. When it comes to clothes for San Francisco, almost anything goes – and that’s part of the appeal of this city. In a place that’s known for being liberal, alternative, and a little out there, there isn’t much that would make locals bat an eye. Combine that attitude with the state’s namesake “California casual”style, and you don’t have much to worry about. Not surprisingly, there are few occasions that would call for high heels. Given the city’s steep hills and uneven roads, the best shoes for San Francisco are definitely flats. More important than wearing a particular style of clothing for San Francisco is dressing in layers. 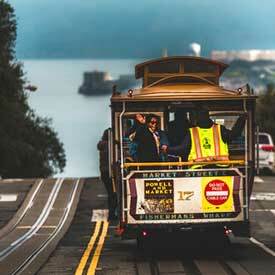 With the drops in temperature in the evening and the sweat you’ll work up on the city’s steep hills, packing for San Francisco is practically like packing for different climates. Visitors to the city will be best served by bringing clothes that layer well and accessories that can easily be added or removed. Overall, San Francisco’s weather is significantly cooler than people from elsewhere usually imagine, so you’ll want to pack warmer clothes than you might initially think. Even during the summer – and in September, the warmest month of year – it frequently stays in the low 70s during the day and dips down to the 50s at night.Rain is also a frequent occurrence, especially in the winter, so you’ll want a rain jacket or umbrella to be prepared. 1) DON’T BRING heavy books – You might want to catch up on some reading during your BART ride or while sitting in one of San Francisco’s coffee shops, but leave the physical books at home. For less than the weight of one book, you can bring a Kindle and have access to as many titles as you want. 2) DON’T TAKE too many clothes – Almost everyone brings way too many clothes when they travel. To avoid having to lug around stuff you won’t need, only bring as many outfits as you’ll actually wear during your trip. 3) DON’T PACK excessive valuables – There’s always a risk that things can get lost or stolen on the road, and pickpocketing is an issue at some of San Francisco’s tourist attractions. Pack the things you’ll actually need, like your camera, and leave your other valuables at home. 4) DON’T TAKE a heavy winter coat – Temperatures in the Bay Area rarely drop down to freezing, so this is not a place you’ll need much cold-weather gear. 5) DON’T BRING only summer clothes – At the same time, many people make the mistake of assuming that California is inherently warm and only bring lightweight clothes to San Francisco. Even during the summer, lows are in the 50s, so you’ll get chilly if you don’t have something to put over your t-shirt. 6) DON’T PACK abath towel – Towels are notoriously bulky and take forever to dry, making them terrible for travel. Your hotel will almost certainly provide a towel, and if you think you’ll need your own, opt for the quick-dry variety. 1) What is the weather like in San Francisco? In general, San Francisco’s weather is mild and fairly comfortable year-round, though the frequent fog and coastal winds make it colder than many people imagine. As in most of the U.S., December-February are the coldest months, with temperatures mostly in the 40s and 50s. It almost never snows in San Francisco, but winter is the rainiest time of year. Unlike the rest of the U.S., however, the city’s warmest month is September, though highs are still just around 72. 2) When is the best time of year to visit? Fall is usually considered the best time of year to visit San Francisco, as September and October are the warmest months and receive relatively little rain. Despite the less pleasant weather, the summer is high season for tourism in San Francisco, so you’ll also benefit from fewer crowds in the fall. Spring is a bit cooler but also less crowded, so April and May are also good months to visit. 3) How can I get around San Francisco? Compared to other West Coast cities, San Francisco has a fairly comprehensive public transportation system – which is good news, since the cost and scarcity of parking can make driving a nightmare. The city’s train and subway system, BART (Bay Area Rapid Transit), has six routes and connects San Francisco with surrounding areas. There’s also a bus system, called the SF Muni, as well as the cable cars, which are a means of transportation as well as an attraction. For getting to places that are beyond public transit, Uber or Lyft will usually be easier and cheaper than a taxi. 4) How much does it cost to visit San Francisco? As one of the most expensive cities in the U.S., San Francisco isn’t the easiest place to travel on a budget, but if you’re careful, it’s possible to do it on around $80 a day. The accommodation alternatives, abundance of free things to do, and availability of cheap dining options can all help to keep costs down. Compared to other cities in the U.S., San Francisco has a large number of hostels, which are among the cheapest places to stay. Couchsurfing is also an option here, with local hosts offering their couches and spare rooms to travelers for free, and Airbnb (which started in San Francisco) is also usually cheaper than hotels. San Francisco is known for its dining scene and is home to some world-class restaurants – but there are also some good budget options. The city’s many ethnic restaurants tend to be on the cheaper side, especially in Chinatown, as do the food trucks. Eating during happy hour can also save quite a bit. Lastly, tours of Alcatraz notwithstanding, a lot of the popular things to do in San Francisco are free. Walking across Golden Gate Bridge, hanging out in the eponymous park, taking a free walking tour, and strolling around Fisherman’s Wharf won’t cost you anything. 5) What neighborhood should I stay in? San Francisco has more well known neighborhoods than nearly any other city in the U.S. – but that makes it even harder to decide where to stay. Since this city has something for everyone, though, it just depends on that you’re looking for. SoMa is known for its foodie scene, Embarcadero has easy access to great hiking, and Union Square has a huge range of hotels and lots of free things to do. Of course, the city’s famed neighborhoods of Haight-Ashbury, the Mission, and the Castro are all great places to stay as well, depending on your style. 6) What are the top things to do in San Francisco? Among the most popular attractions in San Francisco are the Golden Gate Bridge, Alcatraz, and Fisherman’s Wharf. Other top spots include the 1,000-acre Golden Gate Park, the huge public food market at Ferry Building Marketplace and Twin Peaks, which offers the best views of the city. Top museums in the city include the San Francisco Museum of Modern Art, the Asian Art Museum, the California Academy of Sciences, and the Exploratorium. Of course, San Francisco’s many fascinating neighborhoods are tourist attractions in themselves, including the Mission, Haight-Ashbury, and the Castro. And don’t forget to ride a cable car! 7) Where can I go to get off the beaten path? San Francisco is home to a lot of major tourist attractions – and it gets a lot of tourists – but this city also has some amazing places to get off the beaten path. Walk along the coastline at Land’s End, hang out at Dolores Park, or climb the 16th Avenue Tiled Steps. For some less-visited museums, try the Cable Car Museum, the Gregangelo Museum, or Musee Mecanique. Just strolling through one of the city’s neighborhoods can be an offbeat adventure in itself, and you never know what you might find. 8) What are the best day trips from San Francisco? The adjoining cities of Berkeley or Oakland both make for easy day trips from San Francisco, as do the vineyards of Napa Valley or Sonoma Valley. You can also go down to Half Moon Bay or Santa Cruz to surf (or just lie on the beach). Big Sur is a great place for a scenic drive, and the hiking in Lake Tahoe can’t be beat. Muir Woods National Monument, Angel Island State Park, and Mt. Tamalpais State Park are other great places to enjoy nature. 9) What are the top festivals in San Francisco? San Francisco has so many festivals, there’s almost certain to be at least one going on while you’re there. Outside Lands is one of the city’s biggest music events, though San Francisco is famous for its many jazz festivals (including Fillmore Jazz Festival, North Beach Jazz Festival, and San Francisco Jazz Festival), and there’s also Hardly Strictly Bluegrass and the San Francisco Blues Festival. The city has numerous street fairs as well, including How Weird Street Faire, the Haight-Ashbury Street Fair, the San Francisco Street Food Festival, and the Castro Street Fair. It’s probably no surprise that the city hosts a massive St. Patrick’s Day Parade and Festival, and in December is the Christmas equivalent, SantaCon. 10) What vineyards should I visit from San Francisco? Wine-loving travelers in San Francisco will be faced with a choice: whether to visit Napa Valley or Sonoma Valley (or both!). As the country’s largest wine-growing region, Napa Valley is home to an astonishing 400 wineries covering 800 square miles. But Sonoma Valley was actually the birthplace of California’s wine industry, and now has about 100 wineries spread out over 1,600 square miles. Sonoma is relatively less crowded and has a more laid-back feel than Napa, and the tastings are also cheaper. But Napa offers some of the very best wines in the world, and the smaller area makes it easier to minimize driving time. Visiting both areas in one day will mean a lot of time spent in the car, so avid wine drinkers may want to plan separate trips to each. 11) Is San Francisco Safe? Yes, it generally is. Especially in the touristy areas, the worst you’ll probably have to worry about is pickpockets and overly expensive cab rides. There are certain places it’s not ideal to go without a local to guide you, but for the most part it’s not an issue! Just take standard precautions: don’t walk alone at night, don’t carry excessive cash, and try not to stand out as a tourist.